Even though it's almost spring, since I walked home from work today, I was famished when I returned. 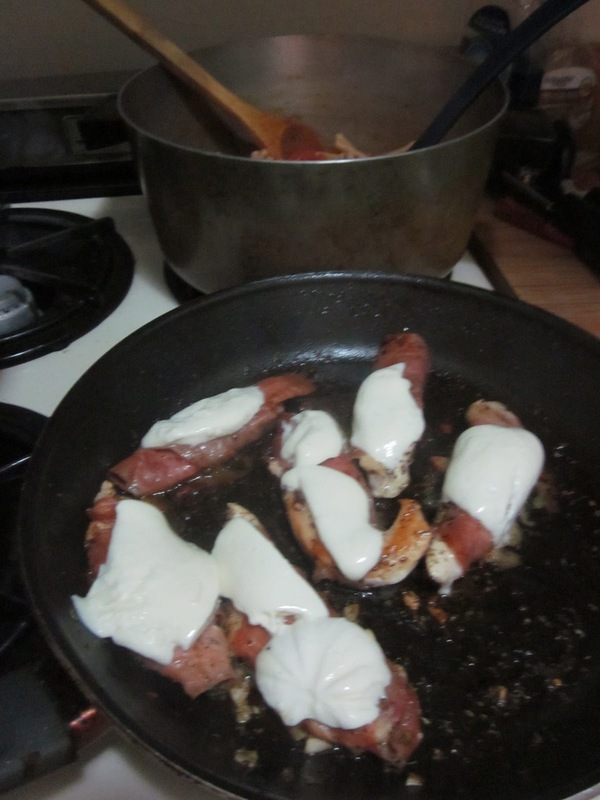 So I decided to go for a more wintry Italian dish that I made up in my head at the grocery store - chicken tenders wrapped with prosciutto slices, topped with decadent melted mozzarella cheese. And I made a side of whole wheat pasta with a homemade sauce. It was quick, delicious, and left me with a few meals' worth of leftovers! 1. Set a large pot of water on the stove to boil. 2. Heat a small saucepan over medium heat. 3. Take each chicken tender and wrap a piece of prosciutto around it at a diagonal. 4. Once the water is boiling, add the pasta and one whole garlic clove. The whole wheat pasta I made called for 11-12 minutes. 5. Heat a large frying pan over medium heat. 6. Apply olive oil and 1 clove sliced garlic to the saucepan. Once sizzling, add onion and 2 tsp oregano and sauté for a few minutes to soften. Add white wine, and let it cook down. Then add can of diced tomatoes and tomato paste. Let simmer. 7. Apply olive oil and 1 clove sliced garlic to the frying pan. Once sizzling, add hot pepper flakes and 1 tsp oregano to the pan. 8. Once the garlic has softened but is not too brown, add the chicken tenders to the frying pan. After about 4 minutes, flip to the other side. The prosciutto will brown slightly. 9. 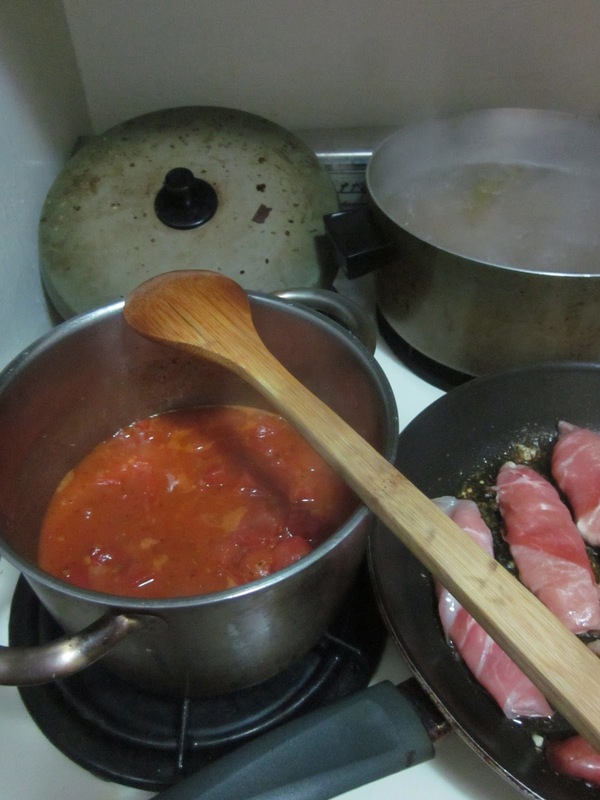 Once the pasta is completed, add 3 ladle-fulls of the starch water from the pasta pot into the sauce. This will thicken it and help it to adhere to the pasta. Drain the rest of the starch water and combine pasta with sauce. 10. Once the chicken is cooked through - tenders are small enough that this will take a maximum of ten minutes - add thin slices of fresh mozzarella and cover to melt. 11. Serve prosciutto-chicken rolls alongside pasta.